This Glengarry Light Infantry coat is one of 15 that were ordered for Fort Wellington in Prescott. I learned some new techniques with these. There are three rows of buttons down the front, instead of the usual lacing. Each row has 12 buttons. The placement of the buttons gives an illusion of broader shoulders, with a narrower waist. The cuffs have two working buttons. The white borders on the cuffs, collar and epaulettes are done by creating piping with Sjt. 's lace. The effect is called feathering. Having never made or used piping before, it was quite the learning adventure. So I have been busy sewing, but have not really completed anything new yet. This being said, I thought I would post a picture of one of the last orders completed. 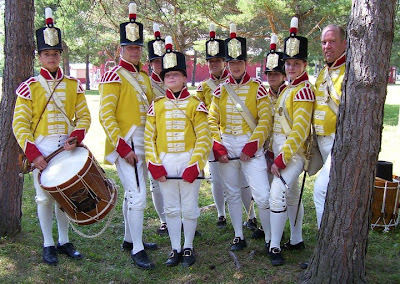 We were asked to dress the Fife and Drums for Williamstown. Schedules were crazy, and the Fife Major has a baby. This made it difficult for her to consider getting it done, so I was enlisted. A whirlwind of sewing ensued, and everything else was ignored (my house really suffered). Though these coats still need their pocket flaps added, we managed to crank out all nine, in a week and a half. They looked as great as they sounded. Now, I have a late comer to dress, and they will all be matching in their bright yellow tunics. I started sewing for my family, so we could participate in historical reenactments. It allowed us to get into a hobby, that has really changed the way we view our history. There is so much more than just the event. There are details to the event, but also a lifestyle/way of life. The fashions, and sense of propriety. I was asked here and there to do a little mending, and then sewing for others. It has suddenly blossomed into a business of its own, and I thought it was time to track where it goes. I invite any who are interested to join me on this journey. To date, I have dressed my family for military life and civilian life in the Revolutionary war, and the War of 1812. I have fine tuned that over the past year, and have made myself a pair of shoes, and a couple of bonnets. I have made several uniforms for others, and the list just seems to want to grow. I look forward to seeing where this journey takes me.